Face-to-face with a great white shark in full breach. The camera’s slow shutter speed lends a 3D effect to the image. Last year was the worst year on record for unprovoked shark attacks, with the predatory fish biting 98 people, according to a new analysis by the International Shark Attack File. That doesn't include an additional 66 attacks either provoked by a human or directed at boats or ships. 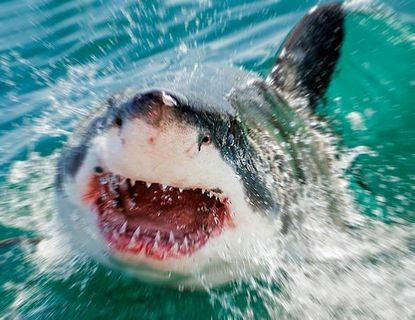 The next highest year for shark attacks was 2000, in which 88 people faced unprovoked bites by sharks. Despite their fearsome reputation, sharks are not nearly as big a threat to humans as humans are to them. Shark numbers have been dwindling for years, a result of overfishing and shrinking habitat, and a quarter of all shark species are endangered or threatened with extinction, according to the International Union for Conservation of Nature. That, however, doesn't mean these aquatic predators are harmless; sharks can and do attack humans, often unprovoked. Of the 164 people who sustained bites last year, a large fraction were simply minding their own business while swimming in the shark's habitat. Many incidents did involve divers who grabbed sharks, spearfishers who were hunting the gigantic fish, or fisherman who got chomped on while unhooking sharks from fishing nets. Still other shark attacks involved sharks scavenging on dead bodies, or sharks ramming or chomping down on boats. Though the shark attacks are no doubt terrifying, they are not actually that deadly. This year, just six of the 98 people bitten died from their wounds and in any given year, the odds of dying by lightning or jellyfish sting are higher. And despite last year's spike in shark attacks, the giant fish are probably not getting more aggressive. Because there are so few shark attacks, the number in any given year may be high by random chance. Long-term, however, the odds of shark attacks may be on the rise. As the human population grows, there may simply be more instances where the two species can come into conflict, George H. Burgess, the curator of the International Shark Attack File at the Florida Museum of Natural History, wrote in a blog post. "The number of shark-human interactions occurring in a given year is directly correlated with the amount of time humans spend in the sea. As world population continues its upsurge and interest in aquatic recreation concurrently rises, we realistically should expect increases in the number of shark attacks and other aquatic recreation-related injuries," Burress wrote.